Continuing in my role as second-hand lens salesman, here's, well, a bee on lavender — a snapshot from outside my front door, on the way out for my walk. BTW, this is not an all-singing, all-dancing, modern lens, but a 20 year-old manual-focus AI-S Micro-Nikkor. Which means, that on my D70, apart from the obvious lack of auto-focus, there's no metering — you have to make an exposure guess, take a test shot, and repeat until you're happy. Which is fine when the light conditions are fixed, but when they vary quickly, it can be a nuisance. Still for 190USD from keh.com, it was cheap (as lenses go, and even considering the cost of shipping it half way around the world). Also, no fancy EXIF aperture data. Details: Nikon 105mm 1:2.8 macro, f/5.6, 1/400s, ISO 200 pushed to 400, crop to square. Well, all the guessing worked for this shot. Beautiful. Excellent detaisl and all the colors look wonderful! The focus is absolutely perfect. Very effective shot. Outstanding macro work! 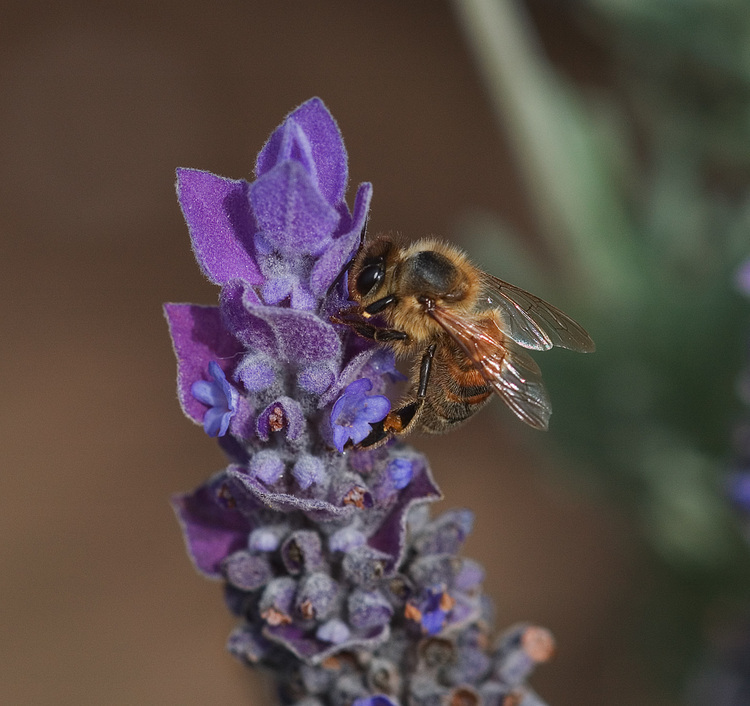 The lavender looks like wool felt and you've captured all sorts of delicate detail on the bee. Fine! That's really great, I'm in love with this picture. You love nature don't you?